Nanoparticles (NPs) of barium hexaferrite were synthesized by a chemical co-precipitation technique in an aqueous solution with a nominal composition of BaFe11(Sn0.5Mg0.5)1−xNdxO19 (x = 0, 0.5, 1). 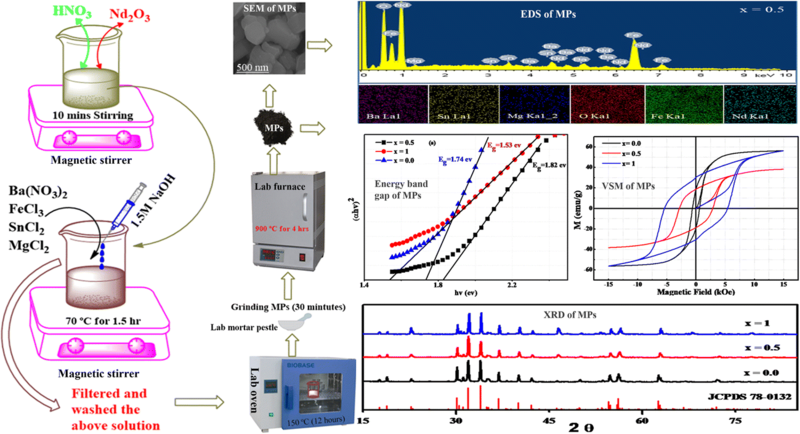 XRD and FTIR analyses were performed to study the crystal structure of the magnetic powders (MPs) in order to obtain details on the hexaferrite structure. Grain morphology and elemental composition were assessed by SEM and EDS, respectively, and nano-sized hexagonal platelet-like structures in all MPs were demonstrated. All of the structural parameters such as “a”, “c”, V(cell) and Dx have been altered with successful incorporation of Nd into hexagonal lattices, thereby the band gap Eg first increased x ≤ 0.5 then decreased up to x = 1 (i.e., drawn via a Tauc plot) from 1.53–1.82 eV. The measurements of dielectric properties depict relaxation behavior at higher frequencies. The dielectric measurements increase with increased hexaferrite. Furthermore, the magnetic properties of all MPs were examined by VSM at room temperature (RT). 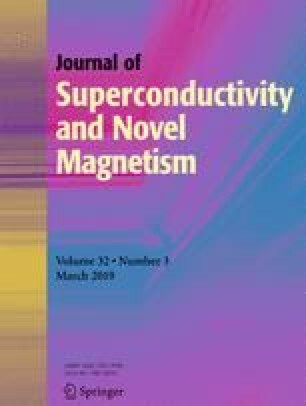 The saturation magnetization (Ms), remnant magnetization (Mr), and coercivity (Hc) were linearly decreased by the SnMg content, whereas an increasing trend appeared with the additional Nd content. However, the squareness ratio increased with an increase in the content (x). These outcomes make this substitution an excellent candidate for multiple applications such as optical, electrical-based devices, circulators, and recording materials. • Ba-hexaferrite nanoparticles synthesized by co-precipitation technique are reported. • Optical energy band gaps (Eg) of MPs drawn by Tauc plot are in the range of 1.53–1.82 eV. • Dielectric measurements express some relaxation behavior at high frequencies. • Coercivity was observed as increasing trend showing its hard magnetic nature. • The ferrites are suitable for many applications as photocatalytic, recording material, etc. This work was done by the support of the National Key Research and Development Program of China (grant no. 2017YFB0701900), and the Science and Technology Commission of Shanghai Municipality (grant nos. 15DZ2260303 and 16DZ2260602).